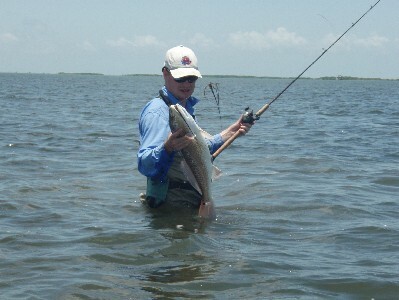 One of the great joys of saltwater fishing is fooling a fish into eating an artificial lure. However, there is seemingly no end to the choices in saltwater fishing lures, colors, weights, smells, and actions. This information will let you walk into your local fishing store with confidence - knowing what you’re looking for, minimally distracted - and walk out with what you need for your next trip. For the Top Picks in the major Saltwater Fishing Lure categories to catch more and bigger speckled trout, redfish, and flounder, head to the Top Fishing Lures page. To learn more about the types of saltwater fishing lures, why they work, and what you need to be successful, keep reading! First we’ll go though the major types, then we’ll go through what makes them work. Also, the Latest Poll Question is about the new Corky Lures from MirrOlure. Head to the Feedback page, take 30 seconds, and give us your take! Click the names to go to the lure pages to learn more. Soft Plastics - At the top of the list because of their versatility and effectiveness. They come in a large variety of sizes, shapes, and colors and imitate everything fish eat. Topwaters – Prized for the aggressive strikes they elicit from trout, reds, and even flounder! Some will fish with nothing else! Plugs - They have caught more fish along the Texas coast than anything. Follow the link to learn more about the old standby. Spoons - Another time tested favorite. Click to learn who likes the gold variety in the bays and what you’ll catch with the silver in the surf. Spinnerbaits - In saltwater? A big yes! Click to find out why and also to learn about their cousins, the In-line Spinners. Crankbaits - Another lure bass fisherman are familiar with. Who loves to eat them? Click to learn more. Corky Lures and Swimbaits - The Texas legend with the funny name comes next. So what are Corky Lures? Click to learn more, get Corky fishing tips, and to hear about yet another lure bass fisherman are familiar with – the Swimbait! Bucktail Jigs and Tied Jigs - Here is an old favorite with a new twist! Tied jigs are one of the oldest fishing lures out there. And they’ve recently been updated to catch more saltwater fish and appeal to the do-it-yourself-er. Gulp! - You were wondering when we’d get to the Gulp! page, weren’t you? Most have heard of them, and they work! Click to learn more about scented baits. The good news here is that finding the fish is half the battle. Once you find the fish, there are quite a variety of saltwater fishing lures they will hit. That being said, there are some hard and fast rules you need to know to help you catch more and bigger fish once you find them. We’ll talk about those rules and then give you our top picks to have to take advantage of the different conditions you’ll encounter. 1. Lures need to resemble the shape and size of the bait the fish are eating. 2. Lures need to be colored so that the fish will see them and be attracted to them. 3. Lures need to be weighted so that they can be cast easily and work well in the depth of water you are fishing. 4. Lures need to be attractive to the fish in their action, sound, and smell. 5. Hooks need to be sharp and sized appropriately for the fish you are trying to catch. 6. Lures need to work with the structure you are fishing. To learn tips about rigging and fishing the different types of lures, click here. Return from Saltwater Fishing Lures to the Saltwater-Fishing-Texas home page.